I bought a used 2010 Prius just a few weeks ago. It’s white and shaped like an egg, and I’ve already begun thinking of “The Egg” as a nickname for it. Don’t misunderstand; I love my new car. I’ve wanted an electric car since my environmentally-conscious teenage years in the 1970s, and a hybrid is the next-best (affordable) thing right now. But I’ve already learned some disturbing things about myself just driving it these last few weeks. I have tended to rocket between stop signs in my pre-Prius years. Not just on the road, but in life. Perking along in The Egg – with an eye to the “ECO Mode” readout on the dash – I’ve learned that easing up to the speed limit and sticking to it gives me time to actually see where I’m going, as well as watch it. This is a good thing, since I had to buy a car to replace the nine-year-old minivan that I wrecked while not paying full attention to where I was going. And I have time to think about where I’m going in life, too … drive time is a good time to reflect on that. Life should be a journey as well as a destination. Getting there should be half the fun. I have also tended to take unnecessary risks to get ahead. Yes, also not just on the road, but in life. Shrieking tires to gun out ahead of someone else is really difficult to do in a Prius (0-60 in 11.9 seconds – not exactly comparable to a Lotus). I’ve had cause to think about just why it is important for me to get ahead in the first place. When it’s not a possibility, I don’t have to uncork the adrenaline worrying about doing it, and I am a less-stressed, safer person to be around. In many ways. All I have to do to quell the temptation to take a foolish risk while driving is to picture a scrambled Egg. I’ve wasted a lot of fuel – and money to pay for it – without really needing to, in the past. (Okay, no unkind remarks about my expanding midsection, please. But I am no longer going to shrug that off by remarking, “I’m just growing as a person.”) I rough-calculated this morning that if I continue to get twice the gas mileage with the Prius that I got with my old car, drive about the same number of miles, and keep it a little longer – say, ten years – and if gas prices remain steady, I will have saved about half the cost of my car in fuel expenses. If gas prices go up, I will of course have saved more – or that amount sooner. I am addicted to comfort. My Prius is heavy for its size (two engines; big battery array) and gives a great ride; it has a very ergonomic interior, soft (heated) leather seats, an adjustable temperature setting that I can set with buttons on the steering wheel, bluetooth access to my cellphone with an answering button on the steering wheel … the options list goes on and on. I didn’t have any of that stuff in my old car, and I would miss it badly if I had to go back. It’s excessive. 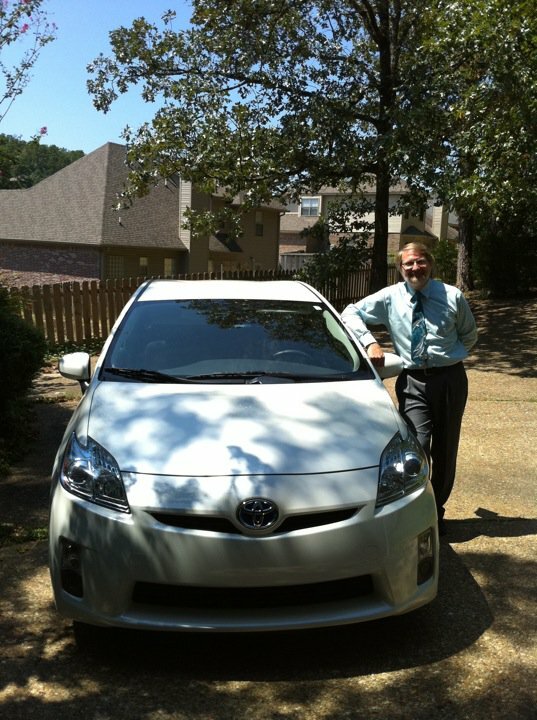 I had no intention of spending as much as I did – or even buying a Prius this new – but I had no objection when it was the one Angi really liked. Jesus would probably not drive a Prius. Okay, this is just purely speculative. My car has some good points, and it may be more economical and in some ways environmentally-friendly than many of its companions on the road, but there are still some realities to face. At the end of its lifetime, I will probably have to pay a fee to dispose of that battery array. It still uses a (low-emissions) gasoline engine, which produces unfriendly hydrocarbons, and consumes petroleum as fuel. But far beyond those concerns – which might or might not concern the Savior – it isn’t walking. Jesus walked. A lot. It put Him among people; people who needed His touch in their lives. So I’m planning to walk more. I can walk at lunch time; there are plenty of nearby eateries where I can hold doors for fellow diners, smile, engage in conversations that almost always will include where I work (at my church) and possibly why. Well, that’s just a little sample of what I’ve learned about me while driving The Egg. I think it’s helping me approach life with an attitude that’s a little less hard-boiled. Your (former) driving habits sound a lot like my Dad’s habits. They lived in a small town near Birmingham, AL where there was a stop sign at EVERY corner of main street. Dad would all but hit passing gear between each stop sign! I hope you can live up to these changes! It’s hard to slow down … on many levels. Any chance some of that walking had to do with the fact that he lived in a country less than 1/3 the size of Arkansas? I’m just not a pickup truck kind of guy, Donna! I am jealous! Bring it to Searcy and let’s cruise down Race Street!